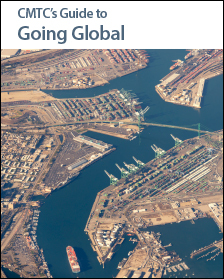 This eBook includes tips on developing and export plan, what products to promote, country selection, resources and programs available. CMTC’s exporting services were critical to helping us increase sales. Their strategic guidance enabled us to significantly improve our exporting efforts and we anticipate continuous growth for years to come. Our company experienced a 46% increase in sales and more than 25% of our gross revenue now comes from international business. ExporTech has given our company a major competitive advantage—in knowledge, insight, connections, and support. We’re years ahead of others because of it. The ExporTech team knows its business and how to make it work for us. The ExporTech Program was an amazing and invaluable experience, which we feel confident will help our company grow exponentially in the international markets.